It’s been raining for two days and gloomy off and on for the past two weeks in Chicago. It’s a gruesome Halloween. I’m hoping all this nasty weather passes so there will be beautiful autumn days and nights when you arrive in The Windy City to attend The International Dairy Show at McCormick Place, from Sunday, November 3, to Wednesday, November 6. For more information, visit HERE. 1) This Sunday, Daylight Savings Time ends. We fall back an hour. That extra hour means you have no excuse on being late to the show. Not only have the days been rainy and gloomy, they are noticeably shorter. So it’s not surprising that a number of news channels have started talking about the importance of vitamin D supplementation. This is because the body synthesizes vitamin D when skin is exposed to the sun. No sun translates to insufficient vitamin D for the body to most effectively function. Interestingly, since the early 1930s, most dairy processors have been voluntarily adding vitamin D to fluid milk to prevent rickets, a bone-debilitating disease that was prevalent at the time and linked to a deficiency in this fat-soluble vitamin. Why do most dairy processors stop at fortifying milk? Why not include this critical nutrient in cheese, yogurt and even ice cream? And why stop with vitamin D? There are a number of nutrients that consumers are lacking in sufficient quantities in their daily diet. Dairy products make excellent delivery vehicles. In 2013, the International Food Information Council (IFIC) commissioned its eighth survey studying Americans’ awareness of and attitudes toward functional foods. This survey has been conducted every two to three years since 1998. It continues to provide consumer insights into consumers’ interests and perceptions about the roles of foods and beverages in promoting health and wellness. 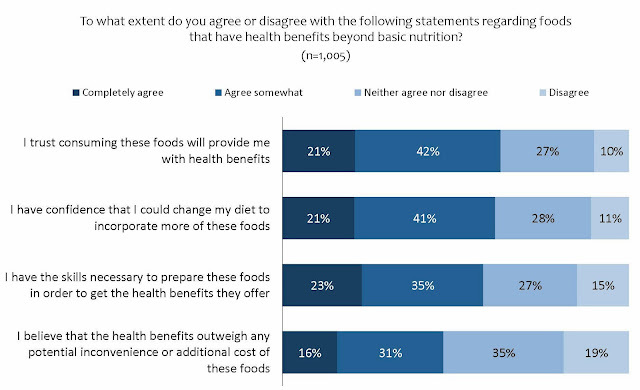 In contrast to previous surveys, which largely explored views on food and health benefit pairings, the latest round of research was designed to investigate consumer perceptions related to nutrient inadequacy, the variety of sources of functional components including naturally occurring and fortified, food processing, and behavioral determinants of functional food consumption. This year’s study took place between July 9 and July 22, with data collected from 1,005 random U.S. adults who participate in a 20-minute web-based survey. Here are some highlights that will hopefully encourage your R&D department to pursue fortification of new dairy foods. 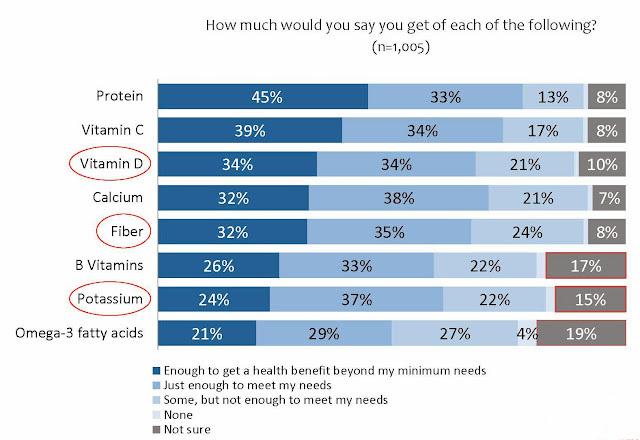 For nearly all of the nutrients or food components examined, at least six in 10 consumers believe they get enough to meet their needs. Omega-3 fatty acids are the exception, as only 50% of consumers believe they get enough omega-3s to meet their needs. 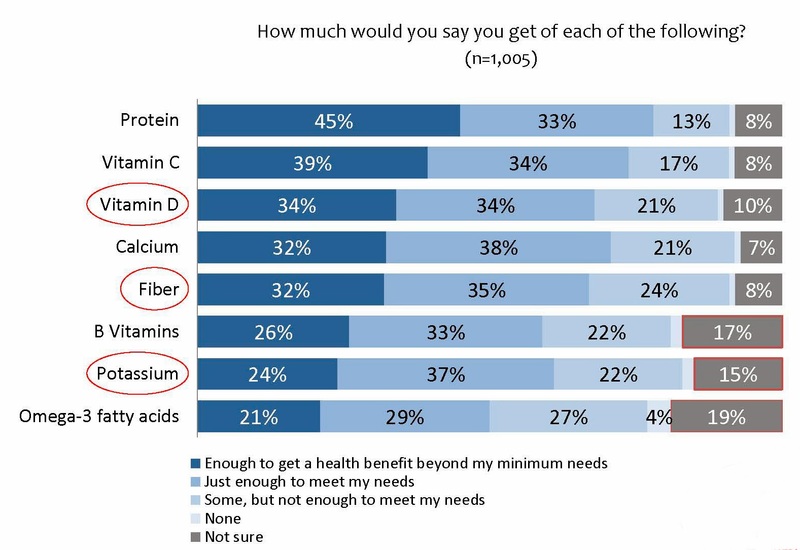 The survey revealed that despite consumers’ reported knowledge about nutrition, the majority (67%) believe they fall short of meeting “all or nearly all” of their nutrient needs. 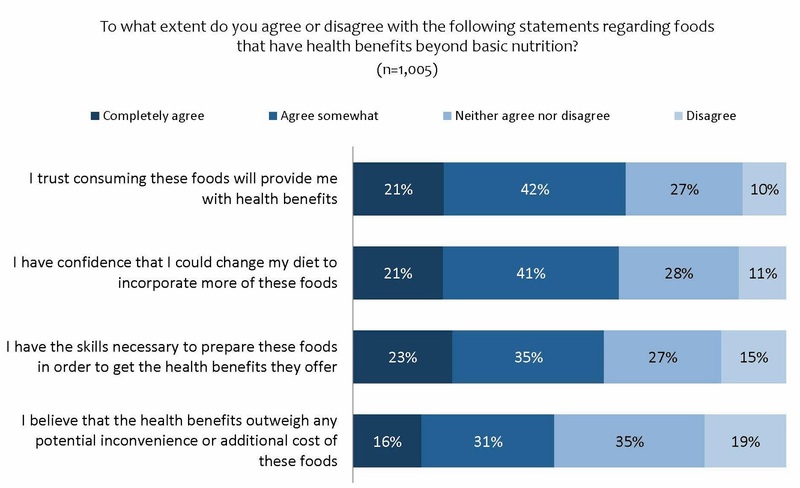 Further, the survey also shows significant disconnects between people’s beliefs about whether they are getting sufficient amounts of many specific nutrients and the reality of their diets, as judged by the Dietary Reference Intakes (DRIs) recommended by experts. A comparison between the survey’s findings about perceptions of diet adequacy (by specific nutrient) and National Health and Nutrition Examination Survey (NHANES) data shows large discrepancies between how many believe their intakes are adequate versus the actual DRIs. For nutrients such as vitamin D (68% perception vs. 32% consumption), potassium (61% vs. less than 3%) and fiber (67% vs. 5%), the discrepancy between perception and reality is quite stark. These three nutrients—vitamin D, potassium and fiber—present a real fortification opportunity for dairy processors. More than half of consumers say they are getting at least some antioxidants and probiotics but many say they are not consuming enough to get a health benefit. There are still gaps in knowledge and consumption of a variety of other functional components, such as lutein, flavonoids and zeaxanthin. 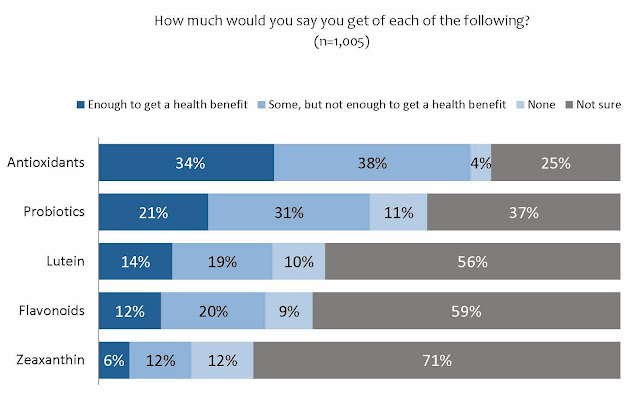 One third, or less, of the population say they are not consuming enough of these components to meet their needs or to get a health benefit. Dairy products can function as a delivery vehicle for all these fortificants. 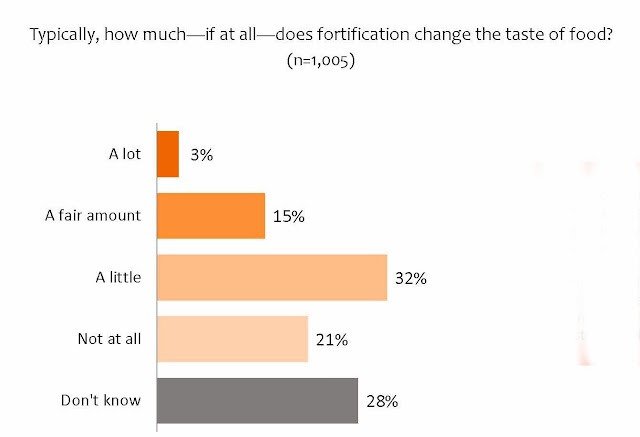 Interestingly, half of consumers think fortification has little to no impact on taste. 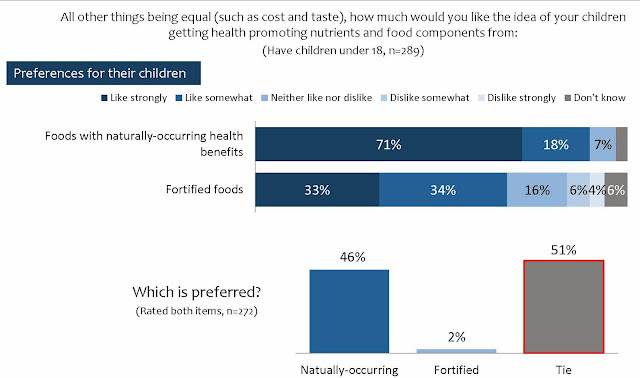 Younger consumers are more likely to think that fortification changes the taste of food at least a fair amount. 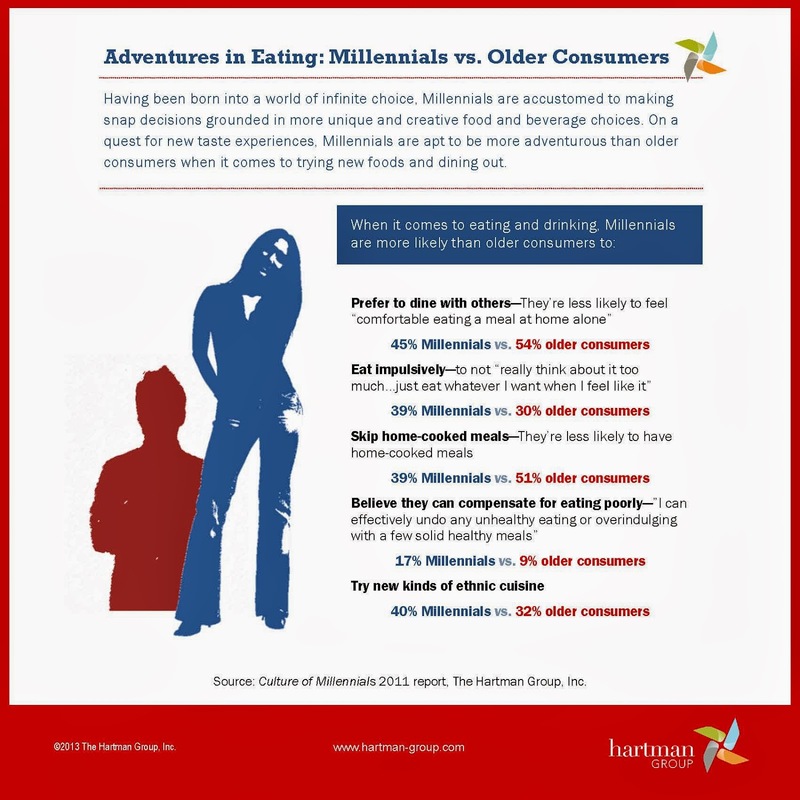 In contrast, a full third of consumers ages 65 to 80 report that fortification does not change the taste of food at all. Even better, half of consumers think fortified foods are more worthwhile than non-fortified foods, while only one in 10 feel they are less worthwhile. 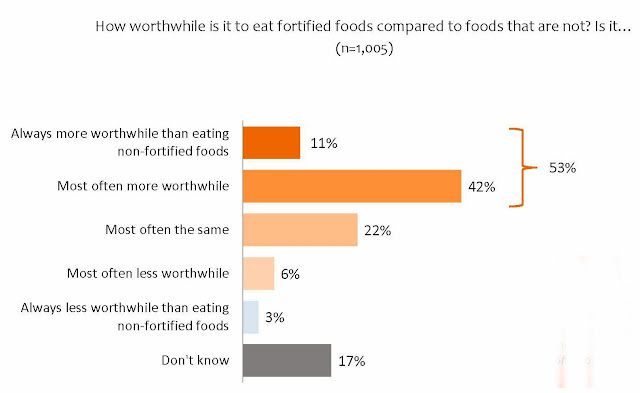 Not surprisingly, consumers who are very concerned about not getting enough nutrients/healthful food components are more likely to think fortified foods are most often or always more worthwhile. What is interesting is how different are their views of fortified foods for themselves, their children and their senior parents. 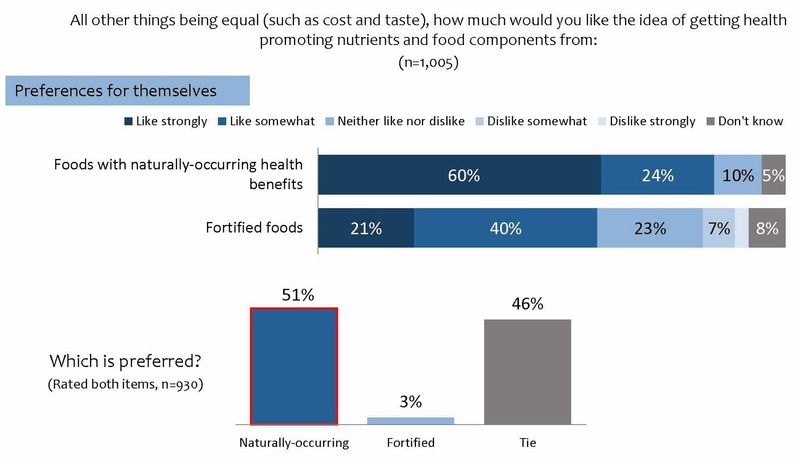 For themselves, consumers like the idea of getting health-promoting nutrients and food components from foods with naturally occurring benefits more than in fortified foods, but nearly half don’t have a preference. 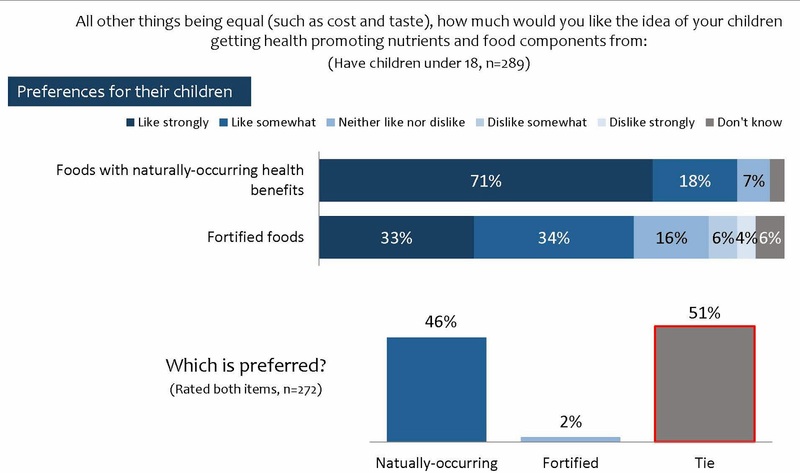 Interestingly, for their children, consumers tend to like the idea of each nutritional avenue more. For their senior parents, consumers like the idea of both nutritional avenues and are even more likely to have a tie in ratings for the two. Here’s the best part. Nearly two-thirds of consumers trust that functional foods will provide health benefits and have confidence that they could make the necessary changes to integrate these foods into their diet. General Mills is one of a handful of U.S. dairies that adds both vitamins A and D to its yogurts. Target Corp., adds vitamins A and D, as well as the omega-3 fatty acid docosahexaenoic acid (DHA) to its new Simply Balance organic milk line. Charley’s Milk is a new line of aseptic all-natural nonfat milks. 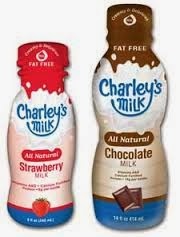 Available in Chocolate, Strawberry and Vanilla, in 8- and 14-ounce plastic bottles, the milks are fortified with vitamins A and D, as well as calcium. An 8-ounce serving provides 10% of the Daily Value for vitamin A, 25% of the Daily Value for vitamin D and 40% of the Daily Value for calcium…and only 130 to 140 calories, depending on variety. For more information, visit HERE. 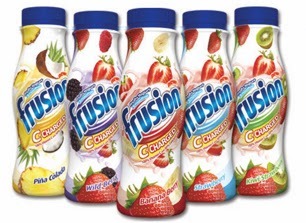 Borden Dairy’s Frusion C-Charged Smoothies are all about the vitamin C. Each single-serve 7-ounce bottle contains a full day’s supply of vitamin C. Read more HERE. 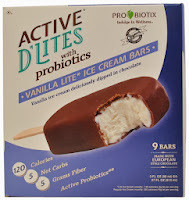 In addition to the 10 billion colony-forming-units of Bifidobacterium Lactis HN019 and Lactobacillus acidophilus NCFM in each bar of Casper’s Active D’Lites with Probiotics Lite Ice Cream, each bar also contains 5 grams of fiber. 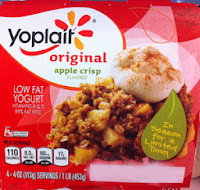 The fiber comes from the inclusion of digestive resistant maltodextrin, fructooligosaccharides and inulin. The fiber is used in both the ice cream and the chocolate coating. For more information, visit HERE. 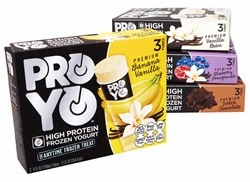 ProYo is as much about the probiotics as it is the protein. The frozen yogurt tubes are also a source of fiber. The product’s development story is an interesting one. You can read it HERE. Even cream cheese wants in on the protein fortification trend. Kraft’s new Philadelphia 2X Protein Cream Cheese Spread delivers twice as much protein (4 grams vs. 2 grams per serving) as regular cream cheese spread. The company achieves this boost in protein through the addition of milk protein concentrate and whey protein concentrate. Read more HERE. And now I sign off to get ready for the ghosts and goblins who will be ringing my doorbell very soon, expecting some candy. 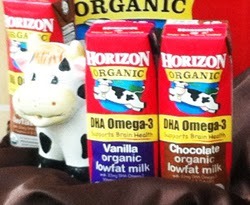 It should be no surprise that my youngest visitors will get a single-serve DHA-fortified aseptic Horizon chocolate milk. Read more HERE. 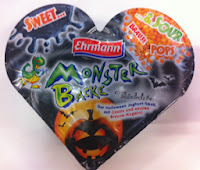 Older kids get candy…after all, I don’t want my housed egged! Looking forward to meeting many subscribers at the Daily Dose of Dairy LIVE! Color, flavor and texture…inclusions provide sensory appeal to all types of dairy foods. But today’s consumers want more. They are seeking out cheeses, dips, desserts and yogurts loaded with goodies that not only liven up the product, but pack in some punch. To read an article I recently wrote in Food Business News entitled “Innovation Through Inclusions,” click HERE. The inclusions ingredient category has come a long way from extruded cookie dough bits and praline pecan chips. The beauty of inclusions is that they allow a dairy processor to create a simple base product—cream cheese, ice cream, yogurt, etc.—and differentiate through the addition of inclusions. These inclusions are typically sourced from suppliers who deliver a consistent ingredient, which prevents variations in the finished product. After careful observation of products already in the global dairy marketplace, a review of other food categories (candies, cookies, snack foods, etc.) that include similar “bits and pieces,” and an analysis of consumer trends, here’s my forecast of inclusion-laden dairy food prototypes you will see at the International Dairy Show, which starts November 3 in Chicago, and eventually in the retail and foodservice channels. 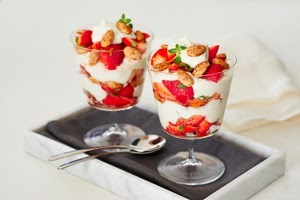 Such premium nuts make ideal additions to fresh yogurt parfaits prepared daily by retailers and foodservice operators. I can see Chipotle offering, you guessed it, a yogurt parfait with chipotle and maple-flavored almonds. Nuts will also become part of more complex inclusions. 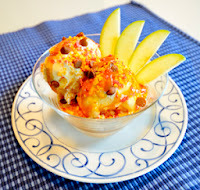 For example, the pictured Pumpkin Pie Ice Cream created by the Almond Board of California includes pie crust pieces containing finely chopped almonds as well as broken bits of almond brittle. And here’s a new product from Spain’s El Pastoret de la Segarra. 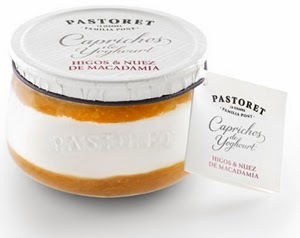 Caprichos de Yoghourt, which translates to Yogurt Whims, is traditional Greek yogurt with upscale inclusions. The product is made daily with fresh milk and high-quality natural ingredients. The company implements a careful production process, adding each layer to a glass container, ensuring that the product’s composition and presentation are of the highest quality and provide the best-tasting experience. Yogurt Whims have a 35-day refrigerated shelf life. 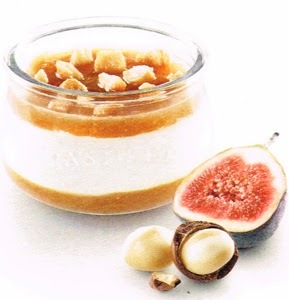 When you peel back the foil seal of the Figs & Macadamia Nut variety, you see large pieces of macadamia nuts resting in a premium fig sauce. 2. Seeds. A close relative to nuts, seeds are not as common of an inclusion in dairy foods. That’s about to change. Sunflower and pumpkin seeds are sources of vitamins, minerals, protein and phytonutrients. Similar to nuts, seeds can be layered with flavors. Honey glazed and chocolate coated are the most common, but when the Food Network showcases innovations such as Sweet Kabocha Squash Ice Cream with Spiced Pumpkin Seeds, you know there’s a lot of opportunity with seeds. Read this recipe HERE. The two seeds that are really gaining traction are chia and sesame. The latter, in particular, is emerging as a star flavor in Asian-style ice creams. For example, Mikawaya USA recently launched Mikawaya Exottics. 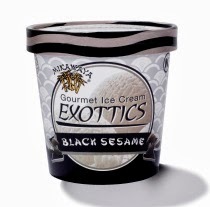 One of the flavors is Black Sesame. Read more HERE. Chia seed is finding a home in yogurt. 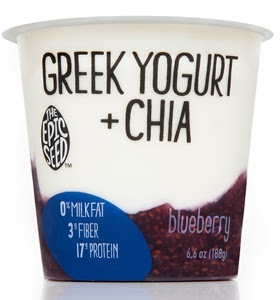 The Epic Seed, from Epic Naturals in California combines Greek yogurt with chia seeds. “Chia is the Mayan word for strength, and some consider it nature’s perfect food,” said Jesse Rudolph, founder. “We believe we’ve filled a void in the marketplace and created a brand, which like the little chia seed itself, packs a real punch.” A 6.6-ounce cup of The Epic Seed contains more omega-3 fatty acids than a serving of salmon, and is loaded with antioxidants, calcium, fiber, iron, magnesium, potassium and protein. The nonfat product comes in four flavors—Blackberry, Blueberry, Peach and Strawberry—with each serving providing 3 grams of fiber and 17 grams of protein. 3. Chocolate. Surprise, surprise, chocolate still reigns as an inclusion in dairy foods. But, this next generation of chocolate inclusions is much more complex than the chips and chunks of yesteryear. 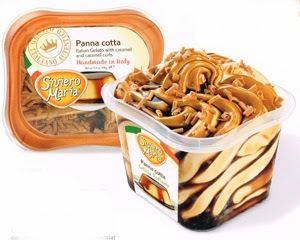 This is exemplified in Italy’s G7’s range of single-serve containers of premium gelato. The Panna Cotta variety is Panna Cotta-flavored gelato with swirls of caramel syrup and topped with caramel chocolate curls. 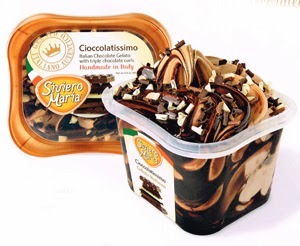 The company also offers Cioccolatissimo, which is chocolate-flavored gelato with chocolate syrup. The gelato is topped with dark and milk chocolate curls. Chocolate works in cheese, too. This product debuted in the U.S. just in time for Valentine’s Day 2013. 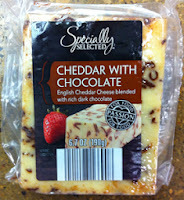 It is “the perfect marriage.” Discount private-label retailer Aldi described its Cheddar with Chocolate as being for those who have “passion for food.” Read more HERE. A new generation of trio-compartment containers for yogurt is making it possible to offer inclusions in the form of delicate curls or shapes. 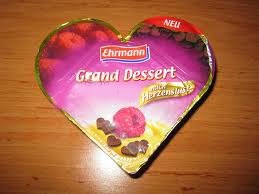 For example, Ehrmann, with global headquarters in Germany and a recent expansion into the U.S., now offers Raspberries and Chocolate Hearts Grand Dessert in its trio-compartment container. Identifying the source or the origins of ingredients--any ingredients—is a growing trend. This includes chocolate and cocoa. At Anuga, Poland’s Getak’s debuted an extensive line of premium novelties available for export. 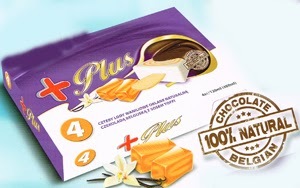 The company prides itself on using 100% Natural Belgium Chocolate, with packages boasting such a logo. 4. Premium Pieces. That brings me to a general trend for all inclusions, and that is boasting a premium positioning. 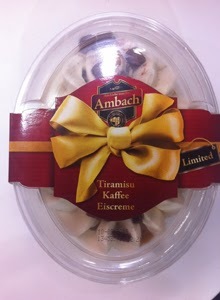 For example, in case you missed Friday’s Daily Dose of Dairy featuring limited-edition Ambach-branded Tiramisu Kaffee Eiscreme, you can read about it HERE. This gelato dessert is real tiramisu. The clear plastic tub showcases the product inside. Starting from the bottom up, there’s a layer of tiramisu-flavored ice cream, real lady finger biscuits, tiramisu-flavored sauce, coffee-flavored ice cream and cocoa-covered cake pieces. This spectacular creation is finished with a drizzle of marsala wine. 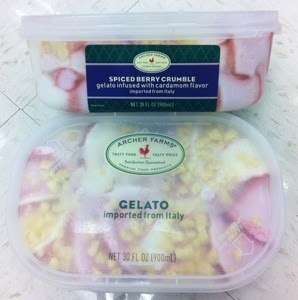 Target Corp., recognizes this clear-container, premium and authentic inclusion ingredient trend for gelato and is now importing product from Italy into the States. Featured here is Spiced Berry Crumble Gelato infused with cardamom flavor. The gelato is topped with real baked cobbler crumbles. 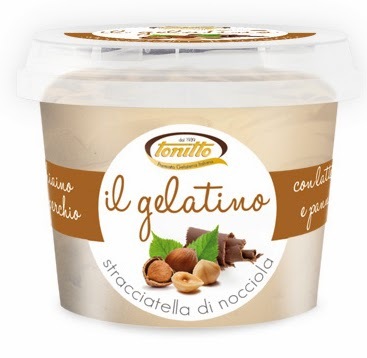 Other varieties in the line include Caramel Biscotti Gelato (with pieces of real Italian biscotti), Chocolate Hazelnut Swirl (with identifiable hazelnuts pieces and delicate chocolate curls) and Pistachio Gelato (with whole pistachios). At Anuga, Germany’s Jermi Kasewerk GmbH introduced a line of premium cream cheese pates. The products are intended for a retailer’s cheese counter and are sliced to order. 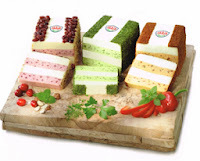 The layered cheese treat comes in three varieties, all made with fresh ingredients. They are: Cranberry and Hazelnut, Green Pesto Herb and Mediterranean. 5. The Unexpected. 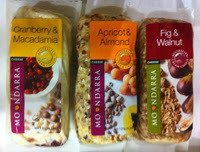 Indeed, not all inclusions are sweet treats, as exemplified by Moondarra, an innovative new cheese offering imported from Australia into the States. The namesake company uses fresh inclusion combinations with a unique method of processing and packaging (vacuum-sealed technology) to allow its innovations to be experienced abroad. The 120-gram rolls of seasoned cream cheese come in three varieties: Apricot & Almond, Cranberry & Macadamia and Fig & Walnut. Read more HERE. 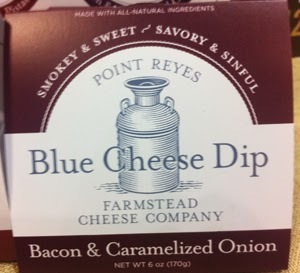 California’s Point Reyes Farmstead Cheese Co., has turned its award-winning namesake blue cheese into a line of premium dips through the use of innovative inclusions. Varieties are: Bacon & Caramelized Onion (smoky and sweet with a hint of Kentucky bourbon); Original Blue; Port, Cherry & Pistachio (sweet and nutty with port-soaked Bing cherries and toasted pistachios) and Truffle & Sage (deep earthy flavors with layers of savory umami). Read more HERE. Caramelized onion is definitely one of the hottest savory inclusions in the cheese and dairy dips business. For example, the U.K.’s Bridgehead Foods Partners now offers a line of snacking cheeses designed for the adult palate. The single-serve 40-gram portions come in varieties such as Mature Cheddar with Cracked Black Pepper, Mature Cheddar & Caramelized Onion and Tangy Mature Cheddar with Chili & Lime. Here’s an inclusion just waiting to surprise and delight. New tortilla chip crumbs from Azteca Ingredients Inc., in Chicago, provide color, crunch and a Hispanic twist to all types of foods. Imagine a savory single-serve cottage cheese with an attached dome cup of tortilla chip crumbs that the consumer can mix in. 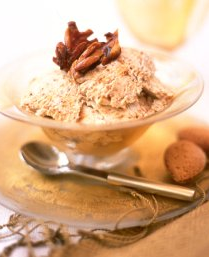 In foodservice, the crumbs can be a topping on a dulce de leche caramel ice cream. The gluten-free, all-natural crumbs come in three colors: blue, gold and red. 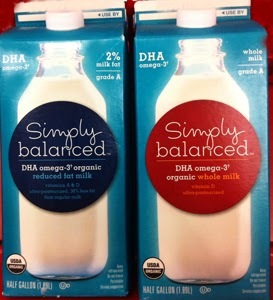 As we approach this weekend before Halloween, when many costumed celebrations start to take place, it’s important to remember that when it comes to products for kids, we can still expect the unexpected, with dairy foods marketers going to all ends in efforts to appeal to their youngest consumer. For example, Ehrmann uses its trio-compartment for its new Monster Backe line. Yogurt is the main component, which makes mom happy. The sweet, fruity component is strawberry, lemon or woodruff. The latter is a popular flavoring herb in Germany. The other compartment contains sour, fizzy candies. Read more HERE. Have a safe and fun Halloween holiday! Mainstream retail sales (dollar and volume) of packaged ice cream and multi-packs of frozen novelties, are at best, flat. But with almost three-fifths of all ice cream and frozen novelty dollar sales coming through foodservice (up from being half of all sales less than a decade ago) according to Packaged Facts’ market research report entitled Ice Cream and Frozen Desserts in the U.S., retail marketers need to do more of what’s going on in foodservice. What is that? They need to make ice cream more craveable. According to the report, sales of all ice cream and frozen novelties topped $25.1 billion in 2011, up 2.4% over the previous year--representing a small upswing after two years of flat sales. Because ice cream and frozen desserts purchased in foodservice channels have a higher ticket price per serving than do their counterparts purchased in retail channels, foodservice is the larger of the two sectors in dollar terms, accounting for 57% of overall sales. Within the retail mass market for packaged products, packaged ice cream is the largest category, accounting for 55% of total retail sales, followed by frozen novelties at 36%. The fastest dollar growth, however, came from the frozen yogurt specialty segment. In the mature U.S. marketplace for ice cream and frozen novelties, according to Packaged Facts publisher David Sprinkle, marketers, retailers and foodservice providers can grow their businesses by creating and marketing products that speak to today’s consumers on an emotional level. This includes localized strategies and niche products representing true differentiation. This is a highly competitive market, with two multinational conglomerates--Nestlé and Unilever--at the top of the heap in the U.S., and actually throughout the world. Across most countries, nonetheless, are hundreds of regional and local competitors that often go head-to-head with the industry giants in particular geographic markets, with many local and regional brands commanding the loyalty of generations of customers. In addition, a slew of niche companies run by entrepreneurs are making more than a blip on the radar screen with innovative and truly differentiated products. Also in the mix is a generous swirl of private label, with the improved quality of store brands making them an attractive price/value alternative to premium brands. For further information on this report, visit HERE. There’s a niche channel that has lots of room for growth in the U.S., and that is the convenience store. I’m not just talking 7-Eleven, rather, it’s the growing channel of corner, neighborhood markets…the type of c-store that has long been the norm throughout Europe. In the U.S., such markets have been limited to the New York metro region and ethnic urban neighborhoods in larger cities such as Chicago, Los Angeles and San Francisco. But that’s changing. Fresh, quick and local fare is helping make mom and pop-type markets (even though they are usually managed by larger corporations) become an attractive grocery destination for “tonight’s dinner.” These markets are selling prepared foods, often with a gourmet or ethnic twist, and are especially appealing to Millennials who crave convenience along with minimally processed. According to the Culture of Millennials 2011 report from The Hartman Group Inc., Millennials eat impulsively. They try not to “really think about it too much...just eat whatever I want when I feel like it.” They are also less likely to have home-cooked meals and they like to try new kinds of ethnic cuisine. Millennials are eclipsing Baby Boomers in numbers and importance. As a demographic group, Millennials (27% of the population) are more numerous than Boomers and are projected to outnumber non-Millennials by 2030. Their estimated $1.3 trillion in current consumer spending is only expected to increase as well. That’s a whole lot of purchasing power. How can ice cream and frozen novelties get their fair share of the Millennial’s pocket money? It’s all about impulse and quality. And this is not likely to change, even when the Millennial gets 2.2 kids and moves to the white picket fenced house in the burbs. A family-sized (half-gallon to 1.5 quart) container of ice cream or a multi-pack of novelties will likely not be on their shopping list. 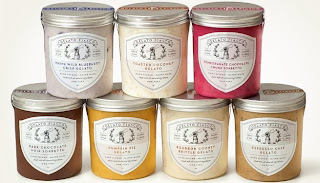 A gourmet pint, made locally or with a philanthropic positioning, as dessert for that evening’s family dinner is possible. But even more likely will be a walk down to the corner store to either get a scoop of freshly made gelato, a premium single-serve novelty from the self-serve case or a soft-serve fro yo with topping bar. According to research from NACS: The Association for Convenience & Fuel Retailing, which just held its annual NACS Show in Atlanta this week, ice cream and frozen novelties were 1.08% of total in-store c-store sales in 2012, with average single store dollar sales for these products being $25,584. This represents a 4.15% increase from 2011. 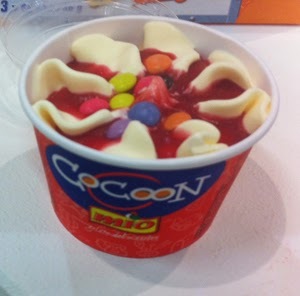 With an impressive nearly 96% of all c-stores selling ice cream and frozen novelties, this growth is expected to be even greater from 2012 to 2013. Is your product in this channel? 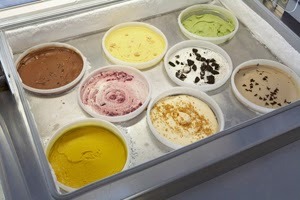 A number of impulse ice creams debuted at NACS. They were not your 99 cents strawberry shortcake stick ice cream bar or malt cup. They were products with a premium positioning. The formulations and the packaging spoke to Millennials. Check them out. 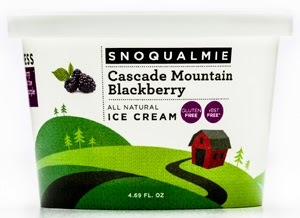 At NACS, the company introduced single-serve 4.69-oz cups of its five top-selling pint flavors: Cascade Mountain Blackberry, Danish Vanilla Bean, Island Coconut, Mint Chocolate Chip and Mukilteo Mudd. For more information, visit HERE. 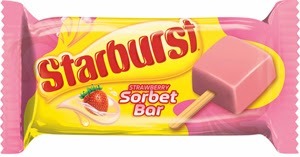 Mars debuted Starburst Sorbet Bars at NACS, which will hit freezers in February 2014. Available in 2.6-oz singles, this new item rounds out Mars’ frozen novelty portfolio and gives consumers an alternative to traditional ice cream products. The suggested retail price is $1.29. 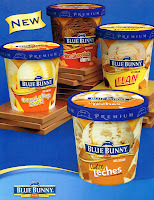 In case you missed Wells Enterprises’ south-of-the-border line of flavored ice creams at NACS, you can read more HERE. Hot Chocolate con Churros: Cinnamon spiced chocolate ice cream with cinnamon sugar churro pieces. These new flavors come in pint and 1.75-quart containers and will be available in March 2014. They are very much on target with today’s ice cream flavor trends. 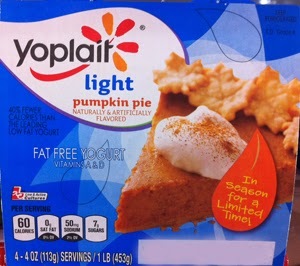 Read “Flavor Trends for Frozen and Refrigerated Dairy Desserts” HERE. At Expo East in Baltimore about a month ago, Gelato Fiasco, a Maine-based gelato scoop shop concept showcased its best-selling flavors in pint containers that are now available for national distribution. Varieties include Maine Wild Blueberry Crisp Gelato and Strawberry Balsamic Sorbetto. 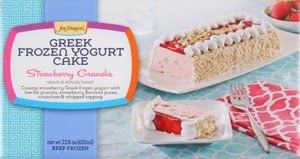 Rich Products introduces Jon Donaire Greek Frozen Yogurt Cakes and Cupcakes. Infused with thick and creamy Greek frozen yogurt, the new cakes and cupcakes are designed to appeal to a youthful audience seeking indulgent flavors, more-healthful ingredients and everyday luxuries. Rich’s is first to the marketplace with a novel portfolio of three offerings: Chocolate Cake, Strawberry Granola Cake and Mixed Berry Cupcake. To read more, visit HERE. The company offers a unique set of merchandising tools and promotional materials for the trade to help sell this Red Carpet dessert. For more information, visit HERE. Italy’s Tonitto, a manufacturer of premium gelato since 1939, used Anuga to debut its new single-serve line of “il gelatino” cups, which include a spoon in the lid. The mini cups use high-quality graphics on the cups to communicate the premium ingredients inside. All of these products are the beginning of a new era of ice cream and frozen novelties designed to appeal to the Millennial consumer. Is your company ready to meet the needs of this booming demographic?